I could not find a recording date anywhere; the Westminster LP seems to have come out in 1952 and this British Nixa issue in 1955; the label states it was recorded in Vienna. As so often with piano recordings from this period, the instrument itself is rather out of tune but somehow that hardly seems to matter! Doremi re-issued Gianoli’s Mozart sonatas not long ago but since the quality of their transfers usually is abysmal I guess we’ll have to wait. thank you very much for the great Gianoli!! with Ormandy (stereo vers. 1962-65). Thanks for the heads up! I was searching for the old prefix »UCCW-« (Universal-Westminster). »JXCC-« was new to me. Do you know if Warner Japan is Westminster’s new owner? I'm sorry, Canetti, I don't know anything about these reissues or the company! I've been listening to Reine Gianoli's Adès Schumann, which I like very much (nicely recorded also.) I am looking forward to hearing her Bach. Thanks a million. Many thanks for sharing this rarity! Thank you. 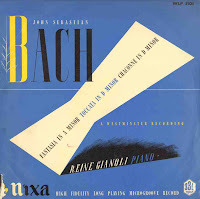 I've not heard this pianist, much appreciated.... Also would love to find a rip of an old 1952 or so Columbia Bach recording of Gyorgy Sandor ML series... the first one.. Cheers. The lute - what's to be grumpy?